Wall Street is melting down and the Presidential campaigns are sowing discord, but here in Floyd County new and old artists are still creating art that touches the heart and imagination. 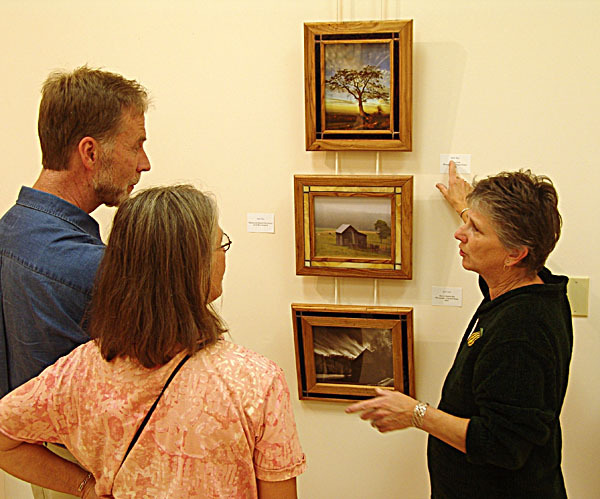 The Jacksonville Center in Floyd County, Virginia, held an Artists Reception for the "Mountain Color" Exhibit at the Hayloft Gallery on Saturday October 11. 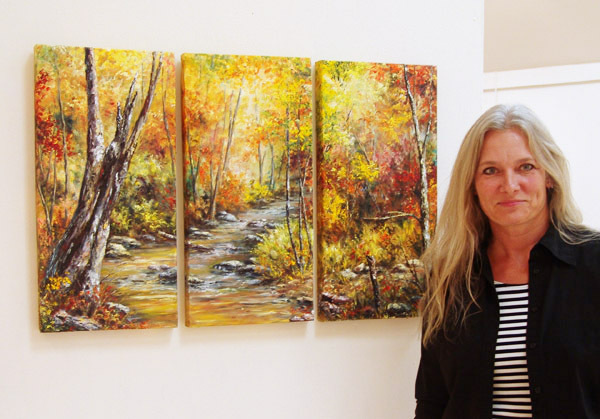 Karen Sewell’s tryptich was titled "Color Beyond Belief" and has already been snapped up by a fortunate buyer. Fred First’s trio of photographic images elicited a lot of favorable comment, both for the subject matter and composition and for the stunning frames created by local artist Ron Campbell. 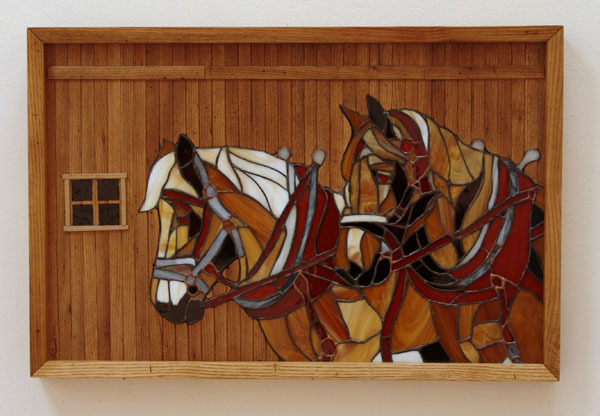 Ron Campbell also submitted this marvelous creation in wood and stained glass titled, "Scooter and Wedge"
Gretchen St Lawrence’s pastel drawing, "Mountain Sunset" attracted a lot of attention. My personal favorite was her still life "Floyd Peaches". 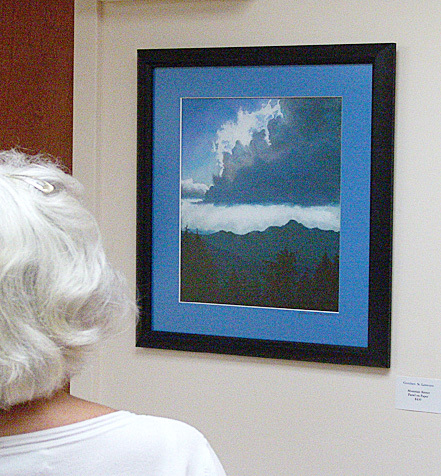 A new artist to me was Barbara Gillespie whose painting, "God’s Hand in Light" lit up one end of the gallery. 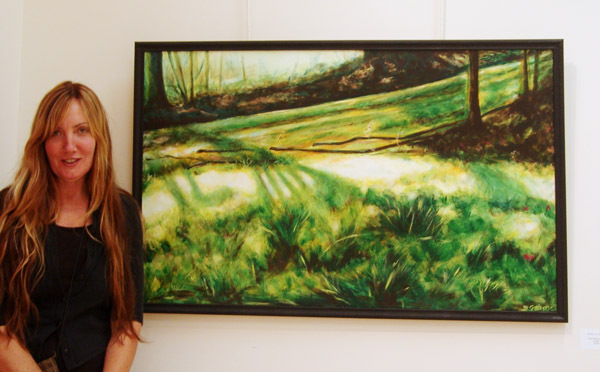 Pat Bonsignore’s paintings have a classical feel and her "Sunlight and Shadow" captivated viewers. 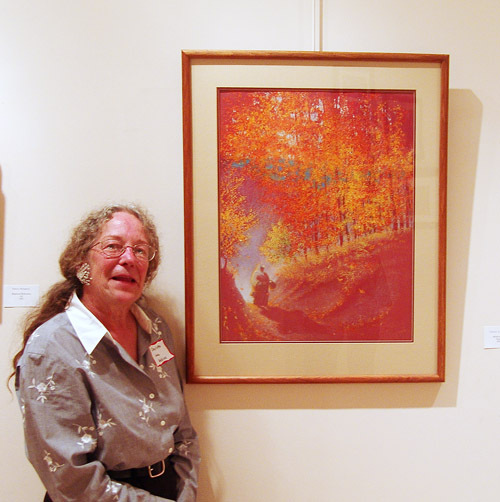 Charlotte Lou Atkins pastel, "Mushrooming" captures the spirit of bygone times and blazing fall colors. 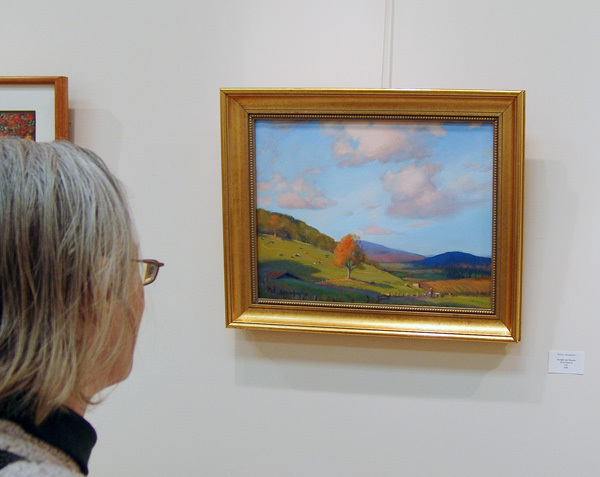 Catherine Pauley, one of Floyd’s art legends, displayed several pieces that were a complete departure from her usual style. 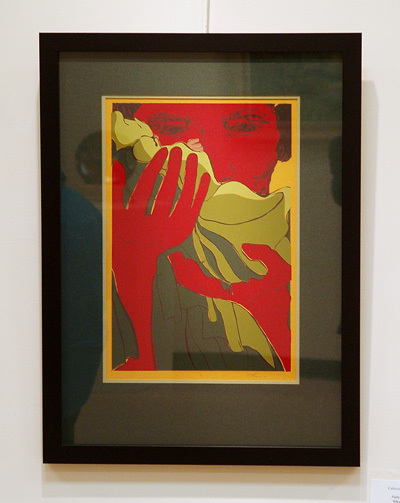 This silkscreen print called "Father’s Day" demonstrates her ability to touch our emotions regardless of what media she work in. time to visit Floyd and the Jacksonville Center. 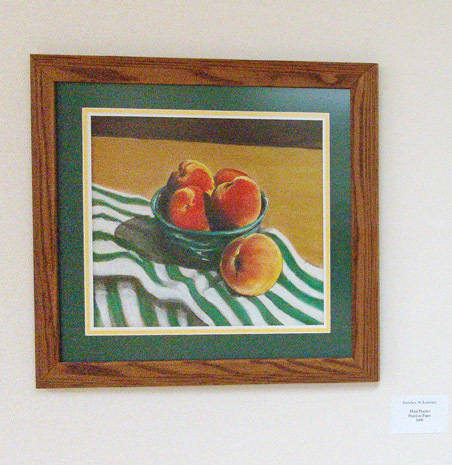 This entry was posted in Artists and their art, Jacksonville Center and tagged Barbara Gillespie, Catherine Pauley, Charlotte Lou Atkins, Fred First, Gretchen St Lawrence, Karen Sewell, Patricia Bonsignore, Ron Campbell. Bookmark the permalink. Wonderful article about the fantastic artists in your area! Thanks, it gives me a way to enjoy even though I can’t be there.